The past couple of days have been such a source of misery for me. Yesterday morning, my husband woke me to say that my dog, Willow, had a bloated stomach. When I called the vet they would not see her and instead said I had to take her to a critical care surgical vet because bloating is a really bad sign. I rushed her 30 miles away to the nearest surgical center and then waited. The news was not good. She has a very aggressive cancer and was bleeding profusely from her spleen. There was nothing they could do. They sent her home with me but were unable to promise one more day. Mike called our vet and made an appointment for today, for him to come to our house and put her down. She was bleeding to death and I didn’t want her to suffer. I have fed her every leftover meal in the fridge and let Dylan give her M&M’s. I slept with her last night and continually told her I love her and that she is the best dog I’ve ever had. Willow was my companion during the darkest days in my life. My parents bought her for me 11 years ago so I wouldn’t feel so alone. She was with me constantly for the first few years. And I knew when she wasn’t with me, she wished she was. Over the past couple of years, since I had kids, she has taken a backseat to them. But she’s always been the happiest dog on the planet. Even this morning, while dying, she wagged her tail and trotted down the hall to get a snack. I will never be the same with out her… she changed my life in a time that I really needed someone to love. Although the past 24 hours have been tortuous for me, I am thankful I had this time with her because she has been with me nearly the whole time, exactly as she always wanted to be. so sorry to hear about your precious dog!! 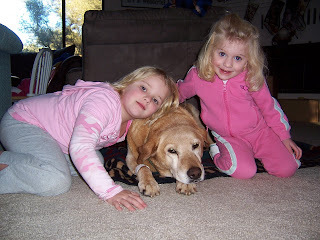 Losing a furry friend is never easy. I couldn't read without posting. I am so sorry for your loss. He spent every day loving you (and vice versa), just what a furry best friend is supposed to do. Oh Kathy, I am so very sorry. My mom just came over and asked if I had heard the news. Even though I was prepared for it, reading your words has me sitting here in tears. I know how much you love her and how much she has been through with you. I think I met her for the first time at Todd's Tool Shower thrown by your parents before our wedding. She absolutely watched every move you made. Feel good about the many years and the wonderful life you made for her. And the wonderful life she helped you have. P.S. I'm very proud of my mom for figuring out how to post a comment. I just had to say that. I am so very sorry to hear about your dog. Pets are family from the moment they find their way into our hearts. My hope is that the love Willow gave to you over the past 11 years will help keep the happy memories close to your heart. Maybe I did go a little overboard. That's what I love about Christmas.